Liam McCarthy and his colleagues; Dan Breen(Tipp Senior Hurling), the Cross of Cashel(All Ireland U21 Hurling), Corn na Cásca(Munster U21 Hurling) arrived at St.Patricks National School Drangan yesterday to very enthusiastic group of kids. To have two of the top forwards in the country, in Lar Corbett and Eoin Kelly as bearers of the fruits of Tipperary hurling in 2010 added to the excitement of the kids. 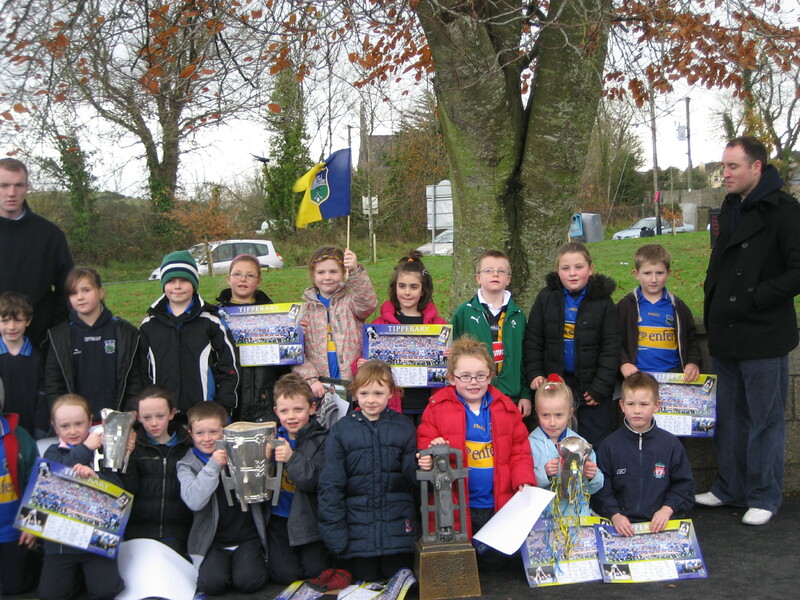 The cups and the hurlers visited Cloneen primary school last week. It is a very worthwhile venture from the county board in bringing the Cup to all schools. For budding young hurlers and camogie players, getting to see the cups and possibly to get their hands on them must be a very satisfying experience. It is days like these that instills dreams into young kids of some day representing their county and possibly claiming that much sought after sliverware. Well done to all the Tipp panel in giving up their time to bring the cup to youth of the county and also to the county board on this worthwhile exercise. This entry was posted on November 17, 2010 at 4:55 pm and is filed under Hurling. You can follow any responses to this entry through the RSS 2.0 feed. You can leave a response, or trackback from your own site.